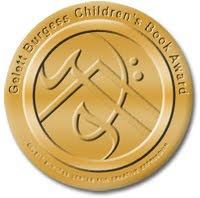 I received more shiny golden stickers in the mail for the Gelett Burgess Children’s Book Award — those of you who see me in person can get one to add to your copy of Enchanted! — and I was curious about the symbol they used, so I asked about it. In relation to the symbol on the face of the award, we found a brief mention of Burgess’ monogram in an online biography some years back. “He made an early mark on the world by carving his initials, in the form of a monogram based on the Phoenician alphabet, near the top of every church steeple in Boston.” (Frank Gelett Burgess) The monogram has been published in several of his books as well. We thought it would be fun to use this because it was truly one of the earliest things he designed. This entry was written by Princess Alethea and posted on September 19, 2012 at 7:00 am and filed under awards, Enchanted. Bookmark the permalink. Follow any comments here with the RSS feed for this post.